It’s not quite clear what just happened at Casio’s Music Gear division. 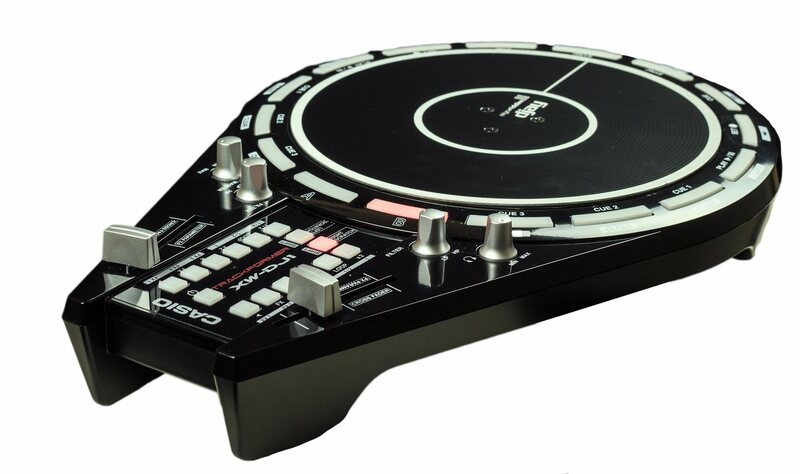 Last year, their XW DJ line included a pedestrian but perfectly innocuous-looking DJ/VJ controller in partnership with Vestax. And so it begins. With the EDM dance market exploding worldwide, you can bet every manufacturer will try to make young dance music fans buy gear, even if they haven’t before. So, let’s try to work out what we’re even looking at. The XW-DJ1 is a DJ “controller” — basically, it appears to be an accessory for Algoriddim djay2. Casio hasn’t sent out specs yet, so we can only guess. If this is USB, they could mean djay for Mac and iOS; if there’s a Lightning connector, it’s an iOS accessory (though for now, there’s no real indication of that). The Millennium Falcon form factor, though, is where things get a bit strange. Loop points are organized in a circle around the platter. On the far side, you have two big switches for A and B. There’s a crossfader, opposite … an effect level? Two separate filters? Transport controls are tucked into a grid at the far side of the controller – right next to the power switch. (I sincerely hope you have to hold that down to trigger it!) There are shift keys next to the transport. And there are tiny toggles for the scratch capability – also crammed in alongside the transport controls. All of this makes sense as a consumer device, but MSRP is US$299.00. Seriously, I think you’d have to be Star Wars Christmas Special crazy to buy this thing, unless I’m missing something. Check out the previous CASIO XW DJ controller, which included a lot of the best controller features of Vestax’s VCI line – and with the fate of Vestax unclear, that might be the best successor to their lines. So, okay. That doesn’t make any sense. What if it were bright red and a groove box instead? You get velocity-sensitive pads. Of course, those pads are in a grid… but then that square is in … a circle. That puts some controls in a ring around the pads (SIMON-style), and others on the side. If you’re left-handed, you’ll get to read the labels upside-down. Well, there’s an assignable fader on the side. And two effect knobs. And it gets still weirder: controls around the side for Master EQ, then metronome, then setting, solo, mute, clear, copy, key shift, max step, swing, MIDI control, pattern edit, velocity, pad volume, pad action… slice length? But then there are tiny buttons for “sampling” and slice length, tap tempo, and data recall over with the transport controls. It’s almost like someone picked where the controls went at random. That’s too bad, because the sampling settings sound cool: you can sample from the mic and audio input in real-time, and do real-time recordings of pad performances. 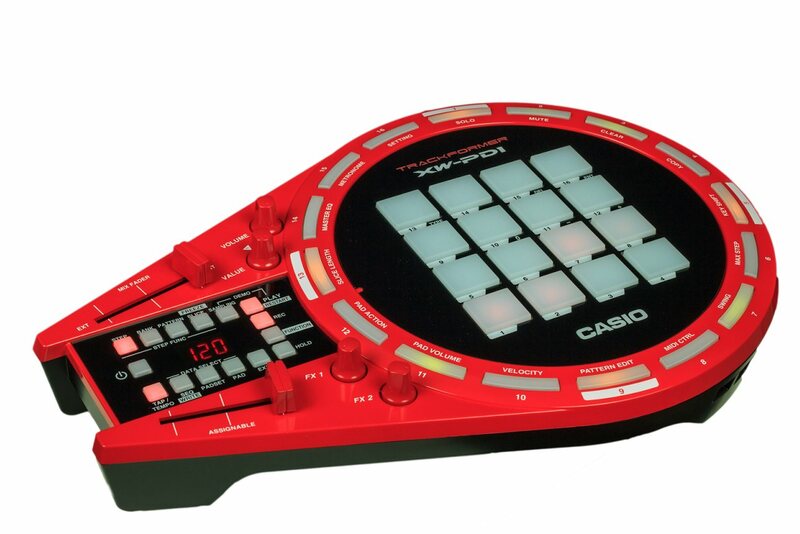 In other words, it looks like Casio had a nice idea and just weirdly put it in a case where the control layout couldn’t possibly make any sense. No word on whether this is battery-powered or has a speaker like the DJ controller. And at US$399.00 MSRP, we know this product will already be up against KORG’s ElecTribe line, to say nothing of rivals from the likes of Roland/BOSS. But, here you go – your first new products of NAMM, already coming out. There will be more. So… save your strength. The groove station ships in March, the DJ controller ships this month. Now, who on The Internet will be the first to remake the Star Wars trailer with the DJ controller composited into all the shots? Go.